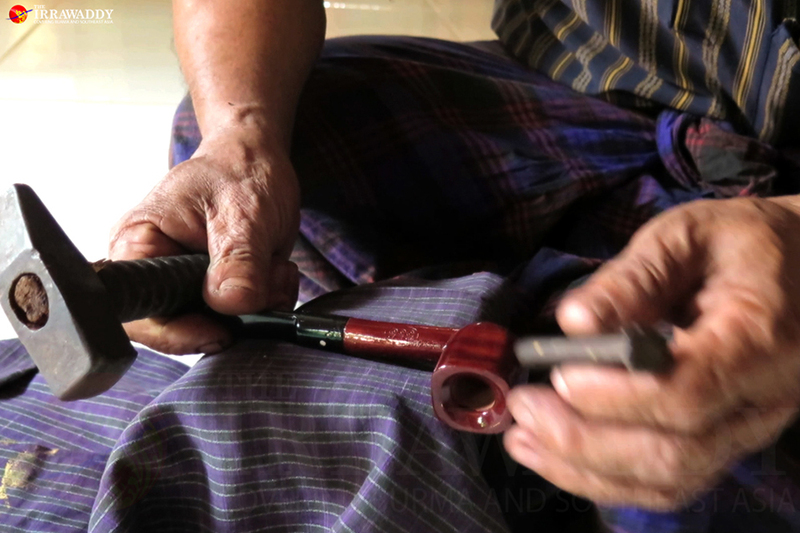 CHAUNG ZON, Mon State — Crafting smoking pipes in Burma has never been a big business, although it has endured through generations. Now the dwindling cottage industry relies on a handful of people in Ywalut village of Chaungzon Township to keep it alive. As part of Mon State’s Belu Islands, Ywalut is a tourist attraction for its handcrafted pipes and wooden walking sticks, while its neighbor, Mudoon, has made itself a name for producing writing slates (known in Burmese as kyauk thin bone). A 10-minute ferry trip from Moulmein (Mawlamyine), the capital of Mon State, Chaungzon Township is a collection of more than 70 villages, with a population of 120,000. 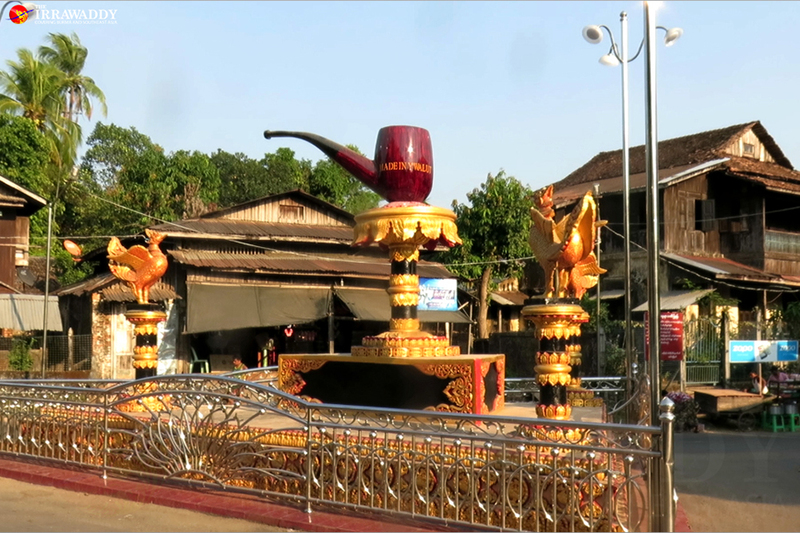 Standing in the middle of Ywalut is a three-meter high ‘Made in Ywalut’ pipe, flanked by three Brahminy Ducks, a cultural symbol for ethnic Mon people. Craftsman Mann Ngwe Win, who has a rich heritage of pipe making, created the sculpture in 2014. He has been making pipes for four and a half decades, inheriting the business, the 555 Special Walking Stick and Wooden Cottage Industry, from his father and working from his own two-story home. The 60-year-old proudly reflects on the legacy of his grandfather, U Nyunt, the first person in the area to make wooden pipes. Working during the colonial era, U Nyunt’s innovative approach to the craft earned him an award in Moulmein, says his grandson. 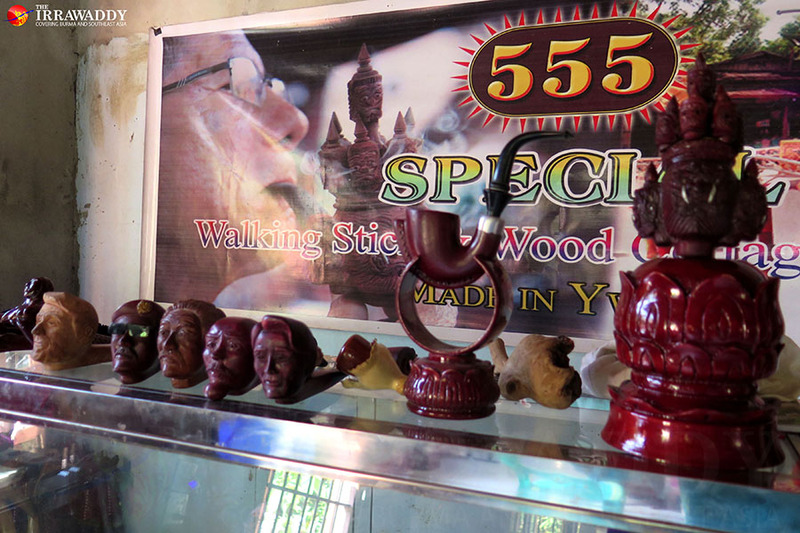 Mann Ngwe Win’s pipes are getting noticed for their quality and distinctive carvings; depicting portraits of former US President Barack Obama, and Daw Aung San Suu Kyi to name a few, as well as the legendary ten-headed ogre pipe. Intricate portraits take at least two days to complete, the old man explains, while a simple pipe could be finished within hours. 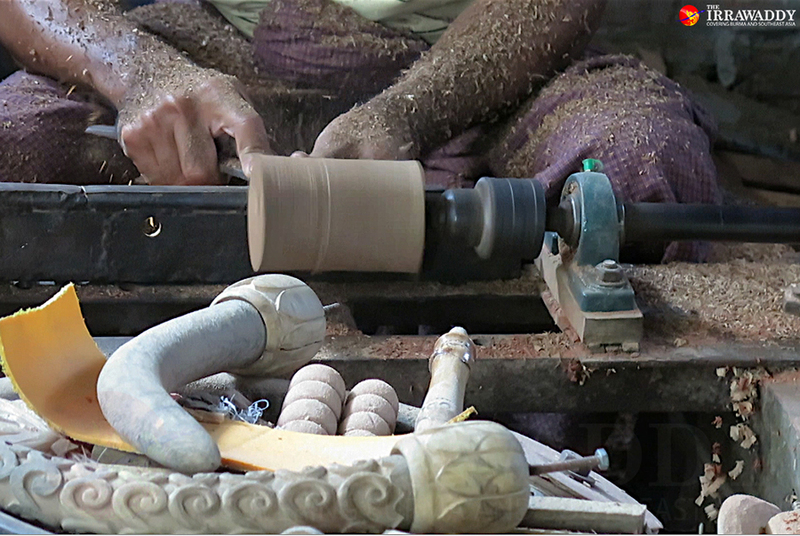 Meghan Menchhofer, an educator and immigration activist from the US state of Indiana, who was visiting Mon State with Moulmein-Fort Wayne Sister City International, examined some carvings in the workshop. 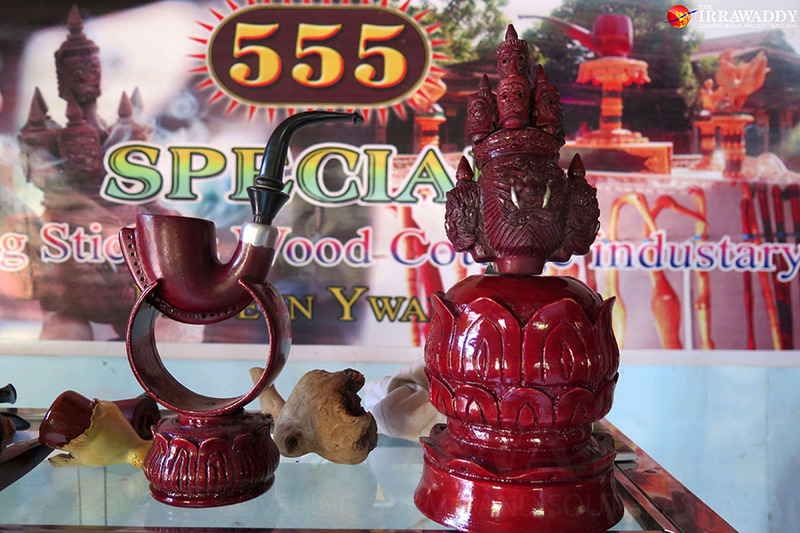 The pipes are made from quality ironwood, ideally from the kino (gum) tree or teak, which is transported from central Burma towns such as Pyinmana. A few families in Ywalut still make pipes and sell them at national markets, mainly west in Arakan State or south in Dawei. Some entrepreneurial spirits produce simple pipes, lower quality than the carved pipes but easier and quicker to make if the orders are there. 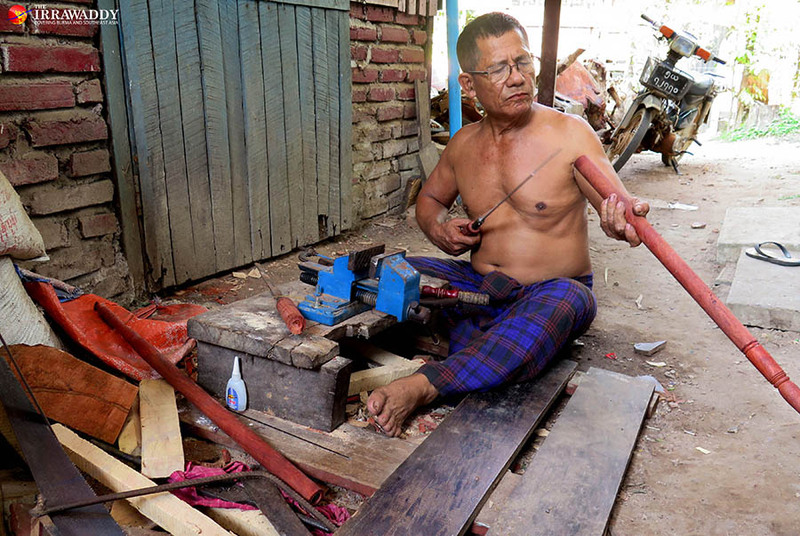 The pipe-making business slumped in the late 20th century because of a lack of raw materials, says Mann Ngwe Win, and many families moved to Pegu and other areas or migrated to neighboring countries like Thailand in search of work. But this has not finished Ywalut’s pipe makers. His eldest son, Aung San Oo, helps him to make pipes and walking sticks. He says a simple pipe will take at least three hours to finish. Walking sticks in the workshop are just as beautiful as the pipes and can be ordered, as can wooden scabbards, too.